Keeping track of staff can be challenging for a small business when you have so many other tasks to take care of. Fortunately there are cost-effective and simple clocking-in options now available to help SMEs manage one of their most valuable assets – their employees. The UK has 1.3 million employing businesses while the number of employees in UK SMEs adds up to a staggering 16.1 million people (2017; government figures). These employees contribute greatly towards the success story of small businesses whose total turnover has been estimated at £1.9 trillion. However, to stay competitive firms need to constantly evaluate the way the business is run to keep costs down and stay productive. Are you managing your staff in the most cost-effective way? Do you know who’s in, who’s out and who’s on holiday or persistently late? Small businesses don’t always have the resources of their larger competitors so need to act smartly when it comes to employee management. Staff management can be particularly onerous for SMEs working across multiple sites and those with shift or remote workers. One affordable solution for small businesses is proving very popular – the use of online ‘time and attendance’ software to keep track of staff. A good SaaS (or ‘Software as a Service’) can help you keep track of staff, but you need to choose the right clocking options for your business. uAttend is a market-leading, cloud-based SaaS clocking system. This easy-to-use service offers a variety of clocking choices which automates the collection and processing of time and attendance data. It means managers can finally do away with fiddly paper timesheets or locally-kept error-prone spreadsheets. Not only can you use it to monitor staff hours but you can export timesheet data to payroll to ensure accurate staff pay, and much more besides. So what are the clocking in options and how will they benefit your business? Swipe card and proximity fob terminals* – the cards and fobs issued to employees work via radio frequency identification (RFID). The cards or fobs send a signal to RFID terminals (readers) when the employee passes nearby. The reader collects and records the clocking in, and out, data. The system gives you reliable and immediate automated timesheet data. Biometric fingerprint terminals* – employees can clock in by simply putting their finger to the terminal. Each employee’s fingerprints are initially scanned and a unique code created based on the scan (the fingerprint itself isn’t stored). When staff clock, their fingerprint is matched to the code on the system. Biometric fingerprint clocking eliminates the need for staff to remember to carry their card or fob. It’s also an effective way to stop ‘time fraud’ where staff may be tempted to clock-in for each other. Facial recognition terminals – once the initial face scanning has been done and a unique code created, staff clock in by presenting their face to the reader. This option also relies on biometric data and can help prevent ‘buddy clocking.’ Images of staff are not stored on the system, only the unique code created when the face was initally scanned. Phone clocking – businesses with remote workers find phone clocking a useful option. Sectors such as care, cleaning and maintenance with workers at different locations can ask staff to clock in by phone by dialling a freephone number and following the voice prompts. Smartphone clocking – employees can clock in using a free smartphone app where the actual geographical position of the employee can be recorded. Web clocking – this option lets staff clock in via the web on tablets or PCs. Employees can also request holidays, book an absence such as doctors’ appointment and add expenses or tips. Another advantage of all these clocking in options is that it gives managers real-time data – they can look at their online dashboard to see who’s in at any time, useful for fire roll call too. *Choose from wired or wifi terminals or readers for these options. 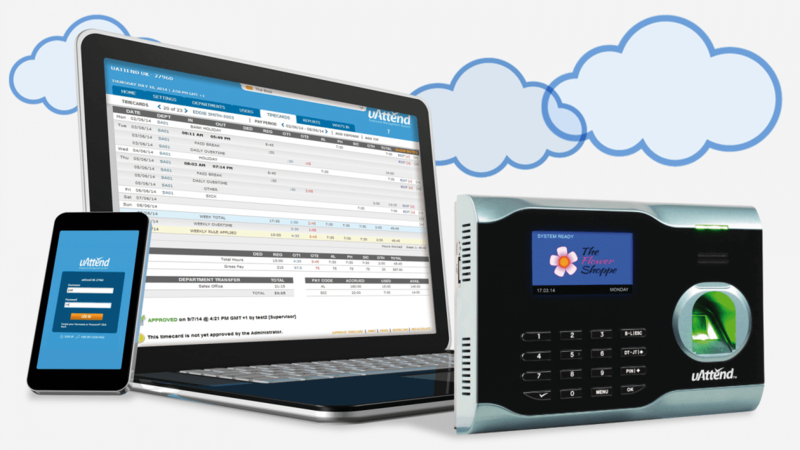 Find out more about choosing the right clocking in option with uAttend.